At long last, Equestria has returned to a state of peace. Celestia can focus on the simple task of ruling her little ponies and bringing about Harmony. Or she would, if she didn't feel that something was wrong. Wrong with her? Wrong with Equestria? She can't tell, and that only makes it worse. Perhaps her friends are right. Perhaps she's become so used to conflict she doesn't know how to relax. That's what the voice tells her, anyway. Preread/edited by Pascoite and OnionPie. Thanks for putting up with me, guys! Vinyl Scratch thought it was a joke. Adhiambo Longstaff thought it was a miracle. Now, two years after fate and an old two-way radio brought them together, all of Equestria will stand with Vinyl to honor the only human they've ever known. A fan-made addition to 'Frequency', by PaulAsaran, and published here with his permission and gracious support. Extra thanks to Paul for his editing and advice! A flip of a coin. A twist of fate. Twilight Sparkle, younger sister of Princess Celestia's personal student, Shining Armor, grew up listening to her brother's bygone dreams of joining the elite of the elite: The Royal Guard. Now, fresh out of the Academy, this young mare is ready to prove herself equal to the deeds of the great soldiers she read about as a filly. Too bad the princess she ends up protecting isn't Celestia. I never thought I would see the Seawall again. Fate, though, seems to enjoy odd twists. Thirteen years ago, it was roses. Now it's feathers. Somehow they've both brought me back to this place, back to the edge of the world to where I really belong most of all. My name is Sunburst, and as a guard of Princess Twilight, her student Azure Sky is both one of the ponies I protect and my friend. I watched her grow up. I, and everypony else, thought we knew exactly where she was headed in life. It seemed so obvious - how could the personal student of a princess have anything but the brightest of futures? We were all so sure. What did we really know? A happy life, a good life, can't be built on a lie. The heart of a unicorn and the heart of a pegasus are different things in some ways, but in the ones that really matter, they're the same. Nopony can endure the misery of an existence devoid of real meaning in their hearts, going through empty motions they feel nothing for, dead on the inside. I think all ponies, deep down inside where it counts, are the same in this way. That's what Azure and I needed to learn, here on the edge of the world, so that I could help her share the things she so desperately needed to find a way to give voice to. Approved by Twilight's Library on December 11, 2014! UPDATE: 8,000 unique views! Wow! I'm incredibly flattered! Plowpony's Day- a day of peaceful rest and relaxation. Or it was, until Twilight Sparkle badly mangled a teleportation spell. It has left her with a bad case of Horn Rot, a disease that if untreated could prove fatal. What's more, the malady is advancing faster than the slow-brewing potion that cures it! There is one swifter cure: the Beneviolet, a star-shaped flower that grows in the distant Archback Mountains, far beyond the western borders of Equestria. Applejack, Rainbow Dash, and Rarity choose to undertake the long journey for the sake of their friend. Their path will wind through floes of ice, across gold-tinted plains, into distant forests glimmering with magic. They will learn much about the world beyond their homeland- and much about themselves, as well. Yes, it's "Dangerous Business," here on FIMFiction. A huge debt is owed to all those who have supported me over the years. I've edited the story some to remove extraneous bolding and italics, but other than that, it remains unchanged. I hope new readers enjoy it as much as old ones did. In No Heroes Book II, Lightning returned to the orphanage that raised her only to watch it – and all the children she loved – burn to ashes. Yet the tragedy wasn't a total loss: she was able to rescue one filly. Burdened by failure, Lightning decides to take tiny Keen Arrow into her care. Lightning has never considered what it might take to raise a child. Has she rushed into another task too big for her wings? Now she's in a position she never would have imagined, and Lightning must make a choice between her dreams of glory and her new responsibilities. But is Keen willing to wait for her to figure things out? This story expands upon the events established in No Heroes. Although reading the series will help in understanding the background material, it is not essential to enjoying the content of this story. Thanks to Mercury Gilado and Absolution for pre-reading! 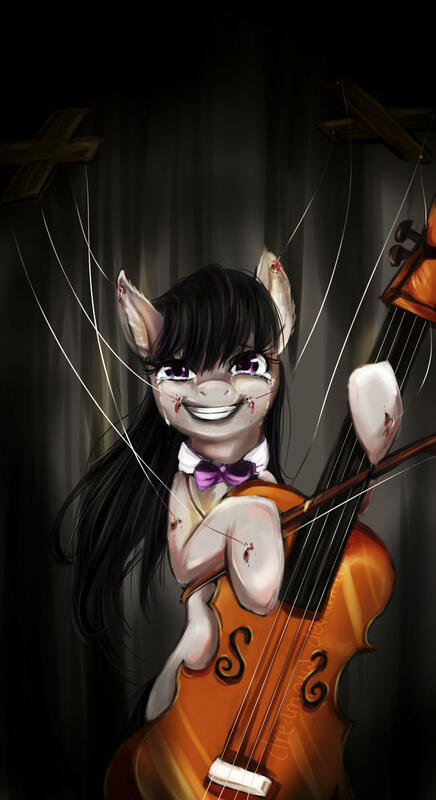 Octavia has always played the piano. From a young age, it was her mother's dearest wish that she would learn, and she couldn't let herself disappoint her mother. So she played the piano. But that isn't to say she wanted to. This is the story of her life, told by her. It's a story about music, family, and self-discovery. Written for the /fic/ May Write-Off, in which it came second place (to DuncanR's amazing Erase and Rewind). A threat is forming in the underbelly of Equestria, a threat whose true nature remains disturbingly elusive to Equestria's Night Princess. With her millennium-old confidants long dead and gone, the newly-returned Princess Luna calls upon a dangerous but loyal ally to gather the ponies she needs from her sister's unfamiliar Equestria. Together, they seek out the underdogs and the overshadowed, the second-place and the unappreciated, those who's virtues are not so readily visible in the light of day. Ponies among whom she has much in common. They are not like the Element Bearers. A big thanks to Eosphorite for the commissioned cover art! My unicorn parents called me a worthless mud pony. They pushed me every day to overcome my lowly status. When I woke up one morning with my cutie mark, I thought they would love me. I couldn’t have been farther from the truth. It was not destiny or enjoyment that led me to discover the cello and composing. My parents made that decision, deciding before I was born I would continue their family legacy of famous musicians. They did not realize what that decision would cost them. Cover Art: Dreampaw. The inspiration for the story. Breath of Plagues: My Pinch Editor. Daemon of Decay: Advice, also inspired me to write fan fiction. Blame him!